The history of the sinking of a trans-Atlantic liner and the hunt for the 43 tons of gold it was carrying. Early in 1917, the Laurentic, an elegant passenger ship refitted for wartime service, set sail from Northern Ireland bound for the United States, laden with gold ingots to finance Britain’s effort in World War I. Before the vessel left the Irish coast, it was sunk by a German submarine as part of Germany’s U-boat campaign. Along with details on submarine development, Williams (Seventeen Fathoms Deep: The Saga of the Submarine S-4 Disaster, 2015) writes like a truly sober sailor, with a vocabulary that includes “coaming,” “paravane,” and “splicing the mainbrace.” The author graphically recounts the sinking and provides a biography of Guybon Damant (1881-1963), the naval officer who undertook the salvage for the Admiralty. Though Damant loved the task, it was not a simple assignment. Clad in inflated canvas diving dress, heavy boots, and globular metal helmets and tethered by lifelines and air pipes that tended to tangle, divers were subject to the bends. Damant became an expert in the practice of recompression. The wreck of the Laurentic was compressed accordionlike and shifting in rough water. Tons of plating and bulkheads required exploding and removal. There was also Admiralty red tape, shifting sand, silt, and crumbling wreckage. Winter weather was bad, and diving was restricted to summers. The effort took seven years, but, eventually, Damant’s group was successful. After he retired, he became a commander of the British Empire. Ultimately, the crew recovered 3,186 of the 3,211 ingots that went down with the ship. Others have since searched, unsuccessfully, and there are still a few bars of gold deep down in what is now an Irish historic site. 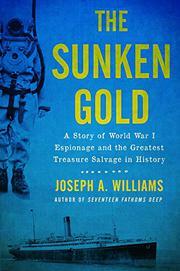 A well-told tale of naval exploits in which gold is the MacGuffin.